Product #20685 | SKU 070000-0000-110 | 4.0 (based on 1 rating) Thanks for your rating! 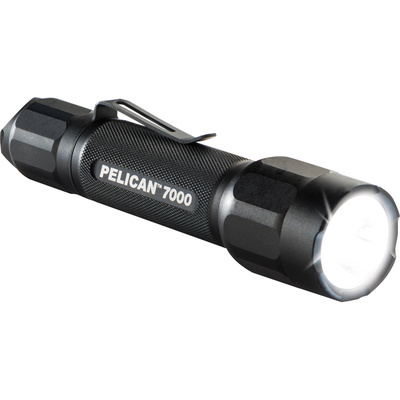 A powerful, portable light, the Pelican 7000 LED Flashlight features a maximum output of 602 lumens from its white LED emitter. The flashlight also has four different lighting modes; high, low, medium, and strobe which offer runtimes from 1.5 to 16 hours. The 7000 is capable of a beam distance of 232.8 m at the highest setting and a peak beam intensity of 13,604 cd. Additionally, the flashlight has an aluminium body construction with an IPX7-rated water proofing. The 7000 functions through the use of a push button on/off tail switch and it runs on the 2 included CR123 lithium batteries. It also has a battery level indicator and has a pocket clip. Really good flashlight, but has CR123 batteries which are expensive to buy and the torch dose not come with rechargeable batteries.